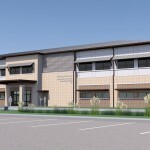 This is a Design/Build project with Guyco, Inc (GC) for the Fort Worth District COE. Located near Texarkana on the Red River Army Depot Base, the Defense Finance and Accounting Service (DFAS) Administration Building houses the administrative and command operations for the US Department of Defense. The 44,000sf building consists of an open office layout on both floors. Arrangement of work stations is easily modified due to the open layout and minimal structure. Locating open and private offices at the perimeter of the building allows for maximum views and daylight at all occupied spaces. Employees can easily circulate through the spaces to the core of the building. A unique feature of the open office area is the raised access flooring. This system allows for easy rearrangement of workstations, electrical and communications modifications, and provides conditioned air to the space. The core contains common spaces such as restrooms, meeting rooms and break rooms. An open atrium at the lobby connects the two floors and allows for natural light to filter into the spaces. The exterior of the facility was designed to complement the newly completed Army Reserve Center. The building is clad with a two-tone brick veneer and EIFS. Horizontal metal wall panels and sunshades help to give the building scale and a modern appeal. The facility has been certified LEED Silver.